A PREVIEWS Exclusive! Funko celebrates the 30th-anniversary of Frank Miller's seminal graphic novel, The Dark Knight Returns, with a special series of POP! Vinyl Figures. From the crime-ridden Gotham City of the near future comes these figures, rendering the characters of Miller's graphic novel in the fan-favorite POP! vinyl style! Each figure stands 3.75" tall and features limited articulation. Build your collection of POP! vinyl figures based on The Dark Knight Returns today! 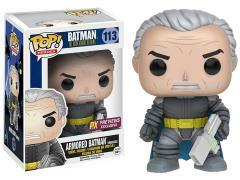 Based on Frank Miller's "The Dark Knight Returns"
Unmasked Armored Batman PX Previews Exclusive Pop!